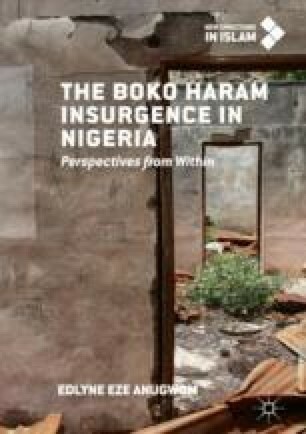 The chapter addresses what can be considered historical antecedents of Boko Haram and the peculiar socio-political context of Northern Nigerian society perceived as conducive to radical expression of religion. The aim here is to provide a thoroughgoing historical and social context critical to understanding how and why Boko Haram sprang up and flourished even with a total rejection of modernity. There is no arguing the fact that right from the nineteenth-century jihad of the revered Uthman dan Fodiyo, the North of Nigeria has been a growth sphere of both moderate and radical Islam. Even before the emergence of Boko Haram, the North of Nigeria has witnessed regular radical and often violent expressions of extreme religiosity. The historical context, coupled with colonial education policy that bothered minimally with achieving conviviality between Islamic education and Western education, created a widespread suspension of Western education and preference for time-honoured Islamic education. Boko Haram has profited from the above history and context.